Date night! Boo and I went out to dinner, and we did a bit of walking to get there. So I tried to keep it light and summer-y because it was suuuuper warm out. I picked up both this tee and skirt the other day during my thrifting excursion. It seems I now collect brightly colored pencil skirts. I have now thrifted 3. I’m on a roll, people. On a roll. 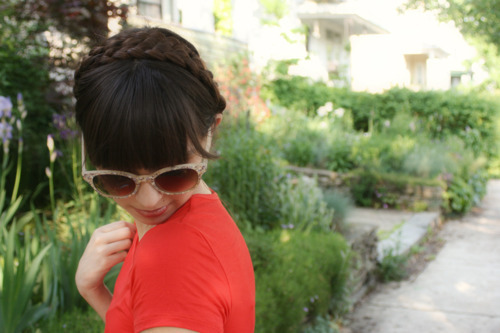 And look- Milkmaid braids!! My first attempt. Not the greatest, but still really fun.